His mouth is frail, a silhouette in a broken sketch. His hands wriggle underneath the school desk, making silent geometric shapes. A trapezoid. A hexagon. Billy wonders if something is wrong with him. The way he dreams up worlds in the sky. Billy draws cages in the corner of his history notebook, watches as they turn into birds. He thinks of the lone bird, soaring across a starless landscape. He thinks of a world that moves at the speed of light—twisting and turning and breathing and swallowing. Billy thinks there must exist something greater in this vast universe, something more than what is. He wants to live in the planet of his sketches. He wants to breathe their charcoal lines. He wants to taste their papery backbones. A triangle. A hexagon. A mouth. A dream. A dream. She reads The Great Gatsby in the confines of her room. She closes her eyes and feels her skin turn into paper. Cracked paper, thin, rough. A dream is not soft. A dream is rough. She says her name out loud. Myrtle. She dreams of lavishness—roses and chocolates and love. But these things were not made for her. These thoughts are not hers to keep. She wonders if light is futile, if one day all the lamps in the world will disintegrate and become dust. She wants to rid herself of her name, of her fate, of the poverty of hope. She writes her name. Myrtle. The green light wasn’t meant for her. Not for her. Their faces begin to blend together. Here he is. The guy who always buys a pack of cigarettes and a bag of Cool Ranch Doritos. He’s been coming here for years. She notices the way his beard falls below his chin like a downward parabola. She notices the oceans in his eyes and the shapes underneath them. Like dream catchers. “Here? I sign here?” he asks. She nods and watches him, realizing she never asked his name all these years. “Star,” she says, and sighs. So he presses the story to his skin. The story he reads every afternoon, after the kids have left the school building. The story he plays over and over in his mind as he sweeps the floors in the cafeteria. It’s a story he’s writing. It’s a story of objects. It’s a story of collecting all the things left behind. He collects everything the kids have left. The notebooks. The pencil shavings. The half-eaten sandwiches. The poems. He arranges them into a face on the center table in the cafeteria and stares. The sandwich eyes, the poem nose, the pencil mouth—the face must have a name, right? He closes his eyes but can’t think of one. She pulls away from her mother’s grip, runs into the cold, deserted landscape. I want to leave, I want to leave, I want to leave she whispers under her breath. I don’t want to be born into this life. I want to leave. It’s not fair. She gulps the beer down faster than she thought she could. She gulps it down before she remembers why. In the neon lights, who she was and who she will be are irrelevant questions. In the neon lights, she is alive. “Billy, what’re you drawing in your notebook?” Emily asks. Billy draws castles and bruises, mouths and dragons. “What’re you drawing?” He draws cashiers and janitors, lovers and their iterations. He wants to say he’s drawing the world. He wants to say he isn’t afraid. He wants to say so much, so much, so much, but he doesn’t know what he wants to say. Myrtle isn’t a name she can erase. The six letters coarse in her blood, in her veins, and Myrtle is not free. Myrtle dreams of dresses and wealth and escape. She dreams of stories and windows to another place. She runs her fingers over the words as if she understands. She’s almost illiterate, but she knows the etymology of her name, the etymology of her pulse. Star. She wonders if it’s his real name or just something he made up. She wonders how many cigarettes he’ll smoke tonight, if he’ll save any for tomorrow. She figures he’ll be back in two days for more. She wonders about his family, if he has kids, a wife, a dog, what their names are, what books he’s read, who he wanted to be. She wonders if he wonders who she wanted to be. He can’t throw away all the things they left behind. It’s not garbage. He reads a poem in the margins of a chemistry notebook that belongs to a girl named Anastasia. It’s a poem about the theory of relativity, the theory of trains, the theory of disappearance. He can’t throw this away. It’s not garbage. He can’t throw any of this away. Together, the things they’ve left behind make a face. And the face is breathing, speaking. And the face is alive, dreaming. She repeats the three words: let me go. Let me go. Let me go, let me go, let me go. As she repeats them over and over, they begin to lose their meaning, seep into her skin. What she’s really saying is that she doesn’t want to go. What she’s really saying is that she wants to draw in picture books, wants to play on the playground, listen to fables until time listens and she doesn’t grow up. But time won’t listen. Let me go, she says, and her mother does. Billy covers up the drawings of bruises and faces and places he knows but has never seen. He looks around the room, at the clock, at the teacher, her glasses falling to the tip of her nose. Billy is a generic name, a common name, and Billy might not be real. Now, Billy is drawing the girl sitting in the darkness, Gatsby’s green light, Myrtle’s red lips, the janitor’s eyes, the marbled garbage face. And all of these things may not be real. But let’s say they are. Let’s say that one day, Billy’s drawings come to life, the garbage face speaks, and Myrtle emerges from the cellar of her story. Let’s say that fiction is more real than anything else. Let’s say that sketches of hope are sketches of flesh, not skeleton. Let’s say that Billy is real, that his sketches are the world. 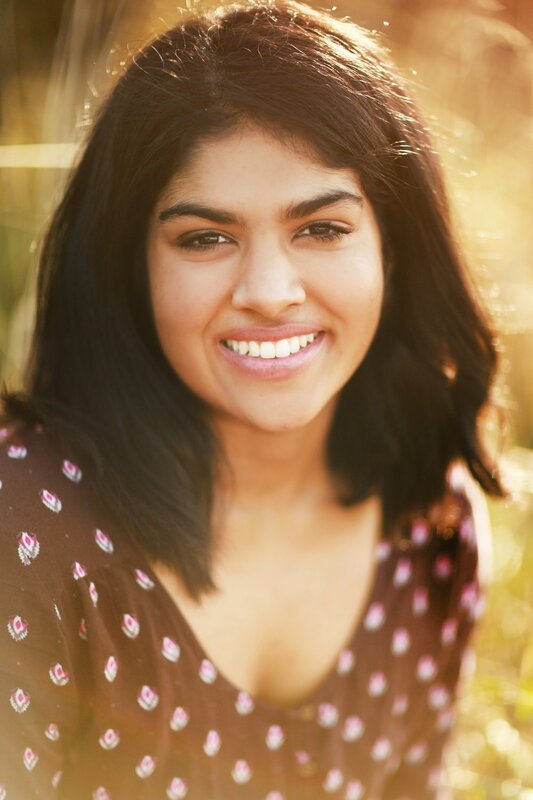 Meghana Mysore is a freshman at Yale University, where she is a Nathan Hale Associates Scholar and writes for The Yale Daily News and The Yale Herald, among other publications. She is a Scholastic Art & Writing Awards National Medalist for Poetry and Writing Portfolio, a fiction finalist in Columbia College Chicago's Young Authors' Competition and an Honorable Mention recipient in the Nancy Thorp Poetry Contest. Her work appears in journals such as Crack the Spine, Really System, Rogue Agent, Third Wednesday and others. She is from Portland, Oregon. This may not count as a souvenir, but in my dorm room, a string of plastic butterflies hangs from the ceiling. To me, these butterflies remind me of one afternoon in India when I was seven and I caught a butterfly. I remember the connection I immediately felt for her. I named her Patricia, and held her in my palms for a while until I eventually let her go. I remember feeling simultaneously sad and hopeful as I let her go, and each time I look at the hanging butterflies in my room, I remember this feeling.